SwordSearcher's "Scan Text for Verse References" tool will save you a lot of time and tedium when researching topics on the Web. Have you ever been reading a web page with verse references throughout the text and wished you could quickly see the verses referenced? 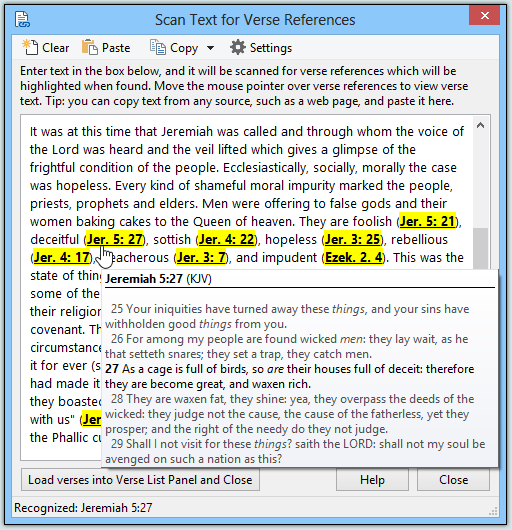 Any text you type or copy into the Scan Text window is automatically "scanned" for references to Scripture. Each recognized reference is highlighted and turned into a hot-link, "tagging" verses. You can hold the mouse pointer over the references to read the verses in a pop-up, or click them to load them into the Bible panel, and more. In the above example, text was copied from a Bible study web page using the clipboard. We pasted the text into the Scan Text tool, and the above picture shows how the result looks -- each Bible reference is tagged, and we can hold the mouse pointer over a reference tag to read the Bible text as we read along in the article. SwordSearcher understands over 2000 variations of Bible book names and abbreviations, and even handles "old style" Bible references written with Roman numerals.